The true history of the site in Tuam has been revealed by local woman Catherine Corless. BISHOP BRENDAN LEAHY has told the Citizens’ Assembly that they in the church “hang our heads in shame” over the Tuam babies revelations. Leahy was responding to a question from one of the assembly’s 99 members who identified herself as Cathy from Tuam. She asked, given the context of the mass infant grave, whether the church had the “track record” to offer its opinion on the care of children. The woman took particular issue with the assertion from pro-life groups that “every life matters”. “How do the church expect us to go along with this given the horrific track record the church and religious orders have when dealing with the most vulnerable and, as you call them yourself, the voiceless weak in our society historically,” Cathy said. And specifically, in the light of the recent discovery of 780 babies and infants bodies thrown into septic tanks in Tuam, and coincidentally I’m from Tuam myself. Katie Liffey, who presented on behalf of the Irish Catholic Bishops’ Conference, first answered the woman. She said she considered pulling out of her speaking slot on foot of the revelations. “It is something that as, I suppose, an ordinary Catholic that I spent the weekend deeply upset by myself and I spent a lot of time reflecting did I want to be here?,” she said. Bishop Brendan Leahy, who had joined Liffey on the stage for the Q&A portion of the session, then responded. He described the Tuam babies revelation as a “wake-up call”. “Obviously I want to echo that sentiment, we’re all as shocked as everyone else about all of this. But I think it just brings home to us the key point is that is that society has to, both the born and the unborn, welcome them, care for them protect them and that’s true always,” he said. So certainly we hang our heads in shame but it brings us back to the fact that this is what we want. To promote a culture that really does care for life both before and after birth. The comments come after the confirmation that “a significant number” of children’s remains have been discovered in sewage containers at the site of the old mother and baby home in Tuam. Speaking this morning on RTÉ radio, government minister Simon Coveney said that it’s “hard to see how that there wouldn’t be garda involvement” in the case. The Irish Catholic Bishops’ Conference was speaking as part of the Citizens’ Assembly’s deliberations on the Eighth Amendment and was arguing that the law be kept as it stands. Liffey had said that it is their belief that people are “the responsible stewards of creation” and that “we are all unique from the moment of our conception”. The Church of Ireland made a short presentation in which Rev. Michael Burrows said that, while it has been the church’s position that terminations should only take place of in cases of “strict and undeniable medical necessity”, it has questioned whether such nuance should be dealt with in the constitution. Atheist Ireland argued in favour of repealing the Eighth Amendment. Earlier this afternoon, the Citizens’ Assembly heard from the Pro-Life Campaign and the Iona Institute who favour the status quo. Amnesty International and the Coalition to Repeal the Eighth Amendment argued for a referendum and repeal. Email “Catholic bishop: 'We hang our heads in shame' over Tuam mass grave”. 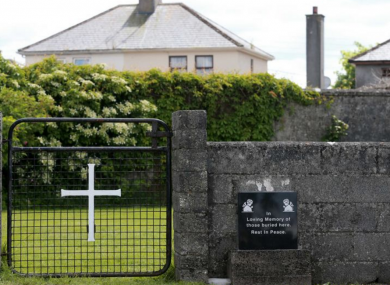 Feedback on “Catholic bishop: 'We hang our heads in shame' over Tuam mass grave”.